The Topo Gigio Debate. 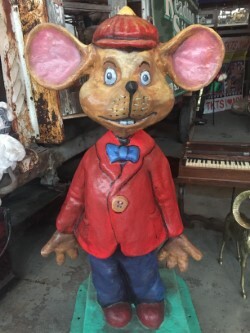 Topo Gigio is a character from an Italian children's puppet show who crossed the Atlantic in the 1960's and charmed audiences of the beloved Ed Sullivan Show. If you remember Ed, you'll likely remember Topo. Described as having dreamy eyes and a childlike personality, he remains popular in Italy today not only on television but in magazines, merchandise, and even movies. One of the most distinguishing features of Topo is his oversized ears. And that's where the debate comes in. The American Treasure Tour has mice all over the place. Now, none of them are living, so far as we know. We have electronic animations, artwork of mice, even some famous mice associated with Florida theme parks. But one of our mice has garnered special attention because visitors claim that he is actually Topo Gigio. So we ask for your help - is our mouse, pictured to the right, Topo Gigio, or some wannabe Topo?